Kids who are bullied often find it difficult to stand up for themselves. Encourage students who are bullied to be assertive: use role-playing and coach students on how to act (looking people in the eye) and say confidently that bullying behaviour is not OK. Help them determine if there is anything they are doing to make the problem worse. Encourage students who are bullied to participate in activities they enjoy or are good at to help them build self-esteem. Highlight their talents for other students to see; this can help them change their reputation in the peer group and reduce their chances of being bullied. 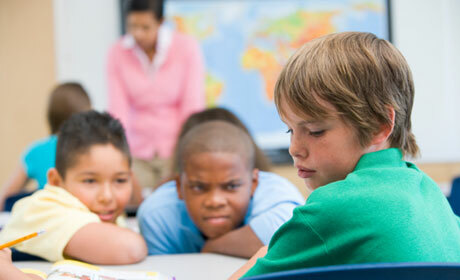 Make sure your students know that it is a teacher’s job to deal with bullying and all incidents should be reported. Clarify the difference between tattling and telling: tattling is what you do to get someone in trouble; telling is what you do to get someone out of trouble. Provide alternative ways to report bullying at school – an anonymous bullying box can help children who may be uncomfortable about coming forward. It takes courage for children to report bullying, be ready to listen.